Ilm al-Miqdar (The science of proportion) is a body of knowledge concerned principally with the study of spatial order through the measure and relationships of forms. Prior to being considered solely as a pure theoretical science, Ilm al-Miqdar once exemplified a body of practical knowledge that proved to be most useful in the architectural planning of many ancient cultures, such as those of Egypt, Mesopotamia and India. Geometric principles became familiar to medieval Muslim scholars through the elements of Euclid, first translated by al-Hajjaj ibn Yusef ibn Matar in AD 790. Their acquaintance with applied geometry however appears to have been through the works of Archimedes, Hero of Alexandria and the compendium of the Indian Text Siddhanta. In the Great Mosque of Cordoba strong geometric principles based on the harmonic subdivisions of a squared circle in which the alternate sides relate in 1:2 and the consecutive relate in 1:√2 proportions appear to underline its architecturalplanning. This paper explores the development of the mosque through time revealing its strict geometric grammer. The layout of the mosque at Cordoba is a unique one. It is not a square nor is it a rectangle, which can easily be explained. The building has many elements belonging to various different periods and, as a whole, was subjected from the late 8th to the late 10th century to a total of five extensions, one merging with another with no apparent break line. The key which began the process of deciphering the language of the building was the tracing of the wall which appeared in M. Gomez Moreno’s plan published in R.A. Jairazbhoy’s Outline of Islamic Architecture, 1972. The question was, was this enormous divided mosque structure pre-planned (which is of course impossible because of the numerous later extensions), or could the architectural concept have been allowed to grow and multiply for two hundred years or thereabouts, so that the later structure would still relate to the original principle? What follows is an attempt to unravel this intriguing question. Of all the published plans of the Great Mosque, Gomez Moreno’s survey appears to be the most accurate to date. Although I have not seen any previously published geometric analysis of the building, the analysis, as shall be seen, suggests very strongly that Gomez Moreno’s measurements were in fact accurate. At the height of its fame, in the 10th century A.D., Cordoba was ‘twenty four miles long by six miles wide and had over 250,000 buildings, including 3,000 mosques, palaces and baths’, (Conti, 1977, p37). Today, these architectural monuments are nothing but ruins, with one exception – the Great Mosque. The building was begun in A.D. 785 by the Emir ‘Abd al-Rahman I and was frequently enlarged and embellished over the years by his successors. ‘Abd al-Rahman I was a member of the Umayyad dynasty who, after the overthrow of his house by the ‘Abbasids, settled in Cordoba in A.D. 756 and established an independent emirate that acknowledged the supremacy of Baghdad in matters of religion. Towards the end of his reign, ‘Abd al-Rahman I realised the incongruity of the Muslims praying in a low-ceilinged improvised shelter, and began negotiating with the Christians with a view to purchasing for a price of 100,000 dinars the site of the church of St. Vincent which, on the advice of the Caliph ‘Umar ibn al-Khattab, they had shared for over fifty years, (Jairazbhoy, 1972, p75). The Christians rebuilt their new church on the outskirts of the city, while the emir demolished the old church and built on its site the Great Mosque of Cordoba in A.D. 784. The plan of the mosque consisted of a walled sahn (courtyard) preceding an eleven-aisled, twelve-bay sanctuary (the prayer hall). Creswell states that the mosque originally consisted of a sanctuary 73.5 metres wide and 36.8 metres deep, preceded by a sahn 73.21 metres wide and 60.07 metres deep, (Allan, 1989, p300). This means that the sahn was deeper than the sanctuary space, which makes the overall shape of the mosque that of a rectangle. This is quite clear in the drawn plan appearing on p.301 of Creswell’s work. Creswell seems to arrive at this conclusion even though his larger plan, shown on p.292 of the same book, shows clearly that the actually surviving evidence of ‘Abd al-Rahman’s period (shaded in black) only extends northward for approximately 10 metres from the T-shaped piers by the entrance. Hoag, in describing the Great Mosque of Cordoba, does not mention the sahn’s dimensions, nor does he describe its geometric shape, but he notes that the sahn had no riwaqs (colonnades), and communicated directly with the prayer hall through doors set between heavy T~shaped piers’, (Jairazbhoy, 1972, p77). What is interesting is that the plan, which accompanies Hoag’s text on the original mosque building, appears almost perfectly square in shape. Accepting that the original mosque had 12 bays, as is agreed by all scholars, a vertical central axis is established (Yl-Y2), as shown on analysis sheet figure 1: COR/A4, passing along the centre of the middle aisle, cutting the qibla wall-line, and again cutting the sanctuary entrance at V. Using a compass, a circle is now drawn from centre V and with a radius VF (F is to the external face of the wall). 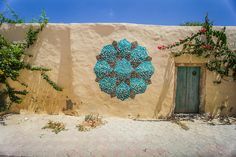 It can immediately be seen that the circle touches the mosque’s east wall at E, its west wall at F, and the qibla wall-line at X. But on the north side, the circle touches the traces of a wall appearing on Gomez Moreno’s plani. The reality of this wall seems to have been accepted by Hoag though he gives no reason for his view. Although it is not mentioned in the text relating to the mosque’s first period, the plan on p.77 of his study clearly shows a wall (with the same degree of misalignment) situated almost 12 bays northward from the sanctuary’s facade. This appears as an actual wall on Hoag’s plan, not a speculative one. If this plan (indicated by Gomez Moreno on the basis of excavation and accepted by Hoag) is acceptable, the result would be a square shaped mosque with corners at A, B, C, and D, and with diagonals B-D and A-C crossing exactly at V. The question presents itself, does this area actually represent the design of the original mosque of ‘Abd al-Rahman I, or is Creswell right in regarding the original mosque as a rectangle? Evidently not, if the recent findings by Felix Hernandez are considered of an earlier minaret built by Hisham I c. the 790s; its north face was about 36 metres from the present sanctuary facade, whereas the present courtyard is 58.5 m. deep. He also found the remains of a wall parallel to the northern side of the sanctuary facade under Hisham I, which had its south side, aligned to the old minaret. At a time which is still uncertain, the sahn was made deeper by about 24 m, (Lambert, p177). Abd-al-Rahman I in 786-788 erected a mosque that K.A.C. Creswell, H. Terrasse, and J. Sauvaget thought was an oblong about 328 feet long and 246 feet wide. However according to present-day knowledge, the original mosque seems to have been an almost perfect square of about 258 feet, thereby following the Medina model, (Papadopoulo, 1980, p252). Unfortunately, Papadopoulo does not give the source for this ‘present-day Knowledge’; presumably it is the archaeological evidence embodied in the present courtyard. My own geometrical evidence supports this. Thus, contrary to Creswell’s view, ‘Abd al-Rahman’s original mosque was a truly square building. The mathematical analysis of its layout given in this section would, at worst, offer corroborative evidence for such a view; and, at best, would clinch the suggestion incorporated in Gomez Moreno’s plan. ‘Abd al-Rahman II had the wisdom to preserve the general character of the mosque’s plan with aisles perpendicular to the qibla and with an interior dominated by superposed columns and double-tier arches. According to most authorities, ‘Abd al-Rahman II was aware of the pressures caused by population expansion and amplified the mosque by carrying the qibla wall another 8 aisles Southward11.’ Although all scholars talk of 8 bays “extension towards the South, Creswell, under the heading “History of the Mosque”, states, basing himself on the observations of Ibn Adhari, that ‘Abd al-Rahman II’s extension of the mosque was 50 cubits deep and 150 cubits wide. Creswell gives the depth of the original sanctuary (prayer hall) as 36.8 m, (Allan, 1989, p300). Thus Creswell gives the correct depth of the extension but draws the wrong conclusion from that information, in that he assumes that the extension was 8 bays in depth. If a cubit be taken as approximately equivalent to 750 mm., ‘Abd al-Rahman II’s extension of 50 cubits must therefore have equaled 37.5 m.iv,’ which is clearly quite close to the original mosque’s prayer hall. This proves that, according to Ibn Adhari, the new extension must have been at least 12 bays deep, matching the depth of the original mosque. Geometrically this makes sense for the following reasons. A-B-C-D marks the original square mosque with its centre at V. Yi-Y2 is the vertical axis cutting C-D at X. With the same radius as previously noted, i.e. VF, if a circle is drawn with its centre at X, it touches the West wall at C, the East wall at D, and on the North it touches the prayer hall’s entrance wall at V. On the South, however, the circle goes beyond ‘Abd al-Rahman Il’s qibla wall (as reconstructed by Creswell) by a certain depth, which leads me to believe that ‘Abd al- Rahman Il’s extension was never by 8 bays only, but in fact 12 bays, and thus constituted an exact duplication of ‘Abd al-Rahman I’s prayer hall. If this is true, the whole history of the Cordoba mosque will need to be rewritten. In drawing COR/A4 period C of the mosque’s development is arrived at, it can be seen that significance of the area by which the second circle intrudes into the space of al-Hakam II’s extension. This space seems to be marked, it has been indicated on analysis sheet COR/A4, by two heavy piers enclosing an area 11 aisles wide and 3 bays deep. Now there is square of E-F—H, with centre at X, with horizontal axis D-C, and a vertical axis Yl-Y2, and with diagonals F-H and E~ crossing at X. This overlaps the earlier square A-B— D.
The question arises, where are the physical remains of the original qibla wall of ‘Abd al- Rahman II on line H-G in the drawing (COR/A4)? 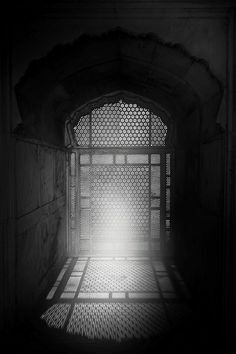 It would not be strange if nothing whatever were left, since it would be the obvious course of action to remove the old qibla wall entirely when extending the mosque Southwards. Nevertheless, I hope to prove that something does remain. The answer to the question lies in the next period of the development of the mosque during the reign of al-Liakam II. According to Jairazbhoy, ‘Great compound piers [were] left to mark the old qibla wall’, (Jairazbhoy, 1972, p81), yet this assumes that the original qibla wall was either an open arcade carried on these piers or a solid wall punctuated by them. Neither type of qibla wall is known in early Islamic architecture. Thus some other explanation must be found for this imposing sequence of piers. Another and quite different explanation for their presence will he suggested below. ‘Abd al-Rahman III assumed the title of ‘caliph’ in A.D. 929 under the name of al-Nasir li- Din Allah, in opposition to the recent founding of the Shi’ite caliphate of the Fatimids at Mahdiya. ‘Abd al-Rahman III’s principal foundation was the residential and administrative centre of Madinat al-Zahra begun in A.D. 936 and to which the court moved in A.D. 945. Nevertheless, he was also active in extending the Great Mosque of Cordoba. It was in A.D. 951 that he extended the sahn to the Northv and built a new minaret for the Great Mosque. The minaret projected into the sahn and avoided the mihrab (prayer niche) axis as it did at Madinat al-Zahra. Its base covered an area of 91 square feet and its height was 111 feet. He was probably also responsible for 3 riwaqs in the sahn; these have since disappeared. He appears to have left the sanctuary untouched. As it has been seen, ‘Abd al-Rahman III confined himself to rebuilding the minaret in A.D. 961 and to extending the sahn. It was his successor, al-Hakam II, who applied to the construction all the resources of Cordoban art. We are told that al-Hakam went in person, along with his jurists and architects, to the mosque to draw out the plan, (Jairazbhoy, 1972, p80), and set down the details of the third enlargement of the prayer hallvi. According to ‘Abd al-‘Aziz al-Dawlati, ‘On the appointment of his khilafa (trusteeship), al- Hakam II began enlarging the prayer hall by two-thirds [the size of] the old hall’, (Al-Dawlati, 1977, p27). By ‘the old hall’, I take it that he means the area including the extensions of periods I and II. If the old hall is divided into three and then compare it with the plan, the extension must have started from the twin heavy piers (3 bays in front of ‘Abd al-Rahman II’s suggested qibla wall)vii. If so, this supports my geometric theory of three intersecting circles encompassing perfectly the three periods of the mosque’s extensions A, B, and D (C is the extension of ‘Abd al-Rahman III). There is no trace of ‘Abd al-Rahman II’s qibla wall. What is there now and what everyone refers to is an arcade resting on massive piers and running across the prayer hall from East to West (line N~ O on drawing COR/A4). I am of the opinion that the traces of ‘Abd al-Rahman II’s qibla wall are still there to be seen. They consist of 2 heavy piers located 3 bays South of the arcade O-N, and I believe that they were to commemorate the old qibla wall, (Jairazbhoy, 1972, p81). The only way al-Hakam could have achieved a 12-bay extension – i.e. an extension on the same scale as those of his predecessors – as well as a double qibla wall, and yet not reach the river, would have been by taking down ‘Abd al-Rahman II’s qibla wall (G-H)vm and rebuilding it Northward 3 bays into ‘Abd al-Rahman II’s prayer hall. His actual extension was of the same size as those of his predecessors, but might have appeared smaller than it was because the double qibla wall took up so much space: indeed it swallowed up the equivalent of 3 full bays. Thus he could have been accused of building ‘only’ a 9-bay extension. To recuperate the ‘lost’ 3 bays, he took a sizable chunk out of ‘Abd al-Rahman Il’s extension and staked out the space thus claimed with an elaborate new arcade (N-O). In the central aisle at the start of the new extension is the so-called Chapel of Villaviciosa. It is a vaulted bay whose walls are open screens of complex arch forms carried on marble columns, (ibid). There are now, as shown in COR/A4, three interlocking circles with a diameter the exact width of the mosque and encompassing perfectly the three mosque extensions A, B, and DK. These proportions are reminiscent of those of the Great Mosque of Samarra’ (al-Malwiya). There one can see, as I have demonstrated in the section 5 of this chapter, a similar proportional system. On analysis sheet COR/A4 I have tried to demonstrate how, if one were to take the sightings of al-Adhari as a basis for argument, E-F-G-H (the size of the prayer hall before al-Hakam) is divided into three parts. Al-Hakam’s extension equals 2/3 of this area. If, on the other hand, it were proposed that the prayer hall before al-Hakam’s extension was E-F-N-O and divided that into three, al-Hakam’s extension does not measure 2/3 of this area. Twenty-five years after al-Hakam’s extension, the mosque could no longer accommodate the masses of worshippers, especially with the new arrival of Berber settlers, (Al-Dawlati, 1977, p28). Al-Mansur began to enlarge the mosque for the fourth time. His dilemma was deciding in which direction to make the extension. On the West, Qasr al-Khilafa (the Palace of Trusteeship) was attached to the mosque’s wallx Southward the river was only a short distance from the qibla wall, and on the North side ‘Abd al-Rahman Il had built the new minaret. The only direction left for him therefore was the East side. Al-Mansur decided to extend the Great Mosque of Cordoba Eastward along its full length for another 8 aisles, (Allan, 1989, p293), so that now there were 19 parallel aisles that looped away for more than 30 bays in a Southerly direction. Finally, in the enlarged sahn which had trees planted in it since the ninth century, al-Mansur built a jabiya (underground cistern). Later it will be illustrated how this configuration of design relates to the overall geometry of the mosque. The question that kept recurring when I examined the mosque’s plan was: why was al- Mansurs extension to the East by 8 aisles and not by 9, or 7? Another question was, if the previous three extensions were one geometric progression, how would al-Mansur carry this through? Having established an overlapping repeated square unit D-C-L-M circumscribing a circle with centre at Y, diameter HO, and vertical axis Yl-Y2 (see drawing COR/A4) and having decided to extend the mosque Eastward, al-Mansur must have sat down with his architect/geometerxi and pondered on how to extend within a geometric formula in order (a) to establish a practical system of building on the basis of which clear instructions could be given to workers; and (b) to arrive at a plan which would relate mathematically to the four preceding extensions, i.e. from the North corners of ‘Abd al-Rahman’s extension to the extension of al-Hakam (L-M) on the South. The solution was simple. Al-Mansur’s architect had two fixed limits to his extension. On the North he had ‘Abd al-Rahman III’s new external wall™, while on the South he had al- Hakam’s qibla wall which was restricted by the river. The only limit he had to decide on geometrically was the East edge. All he had to do was to return to the original unit square, ‘the original mosque of ‘Abd al-Raliman I’, divide the area vertically into three equal parts, and extend these vertical bands along the entire mosque, then simply go Eastward by exactly two parts, i.e. two thirds of the old prayer hall. Seeking to correlate the past stages of the mosque’s building, it is interesting to discover that ‘Abd al-Raliman III extended the sahn to the North by a third, and al-Hakam also extended to the South by two thirds. If a ‘grid’ based on the division of the unit square were to be drawn (i.e. the original mosque of ‘Abd al-Rahman I) into thirds, the result would be a large pattern of small squares horizontally and vertically, in which the entire mosque, including al- Mansur’s final extension, occupies a total of exactly 35 units. When the grid of squares is superimposed on the mosque plan, it yields 7 x 5 equal squares. The jabiya is on the sixth line of squares, South of the qibla and the minaret is on the seventh line, occupying exactly one-ninth of its square. According to measurements published by RIBA, (vol. VIII, 1882-3), the overall width of the building is 130 m., taken from external face to external face of the walls. The width of the inner building, which, as has already been explained, is related by many historians to Period A*111 of the building’s history, is 78.39 m., taken from external face to external face of the walls. Towards the end of the geometric analysis of the Great Mosque of Cordoba, I concluded that the entire building appears to form a great rectangle made up of five equal units across its width and by seven of the same units along its length. The area relating to Period A is made up of three units by seven units. The width of Period A building is 78.39/3, i.e. 26.13 m.
Could therefore 26.13 m. square be the area of a unit measure on which the entire building was based? 26.13x 5 units = 130.65 m. published width 130 m. a margin of 650 mm. 26.13x 7 units = 182.91 published length = 182 a margin of 910 mm. In a recently published article by Martin H Mills, (1991), entitled ‘The Pre-Islamic Provenance of the Great Mosque of Cordova™’ the author bravely questions the true origin of the Great Mosque of Cordoba, stating that it is time to re-examine the concept of an Islamic origin of this building, one which has been accepted by historians for over a thousand years, including al-Rin in the fourth-tenth century, al-Idrisi, and Ibn Adhiri. Mills invites his readers to evaluate with him the evidence that could support a more ancient provenance and, although I had already concluded my chapter on the Great Mosque of Cordoba years prior to reading this article, I am glad to be able to consider Mills’s work. For many years during my research I have pondered the question of the orientation of the Great Mosque of Cordoba, constantly coming up against the question, why does this mosque not face Mecca? The common answer is that just as the Syrians back in Syria turned southwards to face Mecca, the founder of the Great Mosque of Cordoba likewise remained facing South, even when in Spain, to emphasise the sentiment that the Umayyad dynasty never in reality left its homeland. Consequently, the founder’s descendants maintained the custom of praying towards the South, even though they had numerous chances to change the qiblah during the many extensions that were made to the Great Mosque. Although the subject of orientation itself does not directly affect the analysis of the building’s geometric characteristics, it is nevertheless found that the plan’s rigid geometric principles, even during the process of adding extensions, may confirm the fact that the Muslims were perhaps building within already marked-out boundaries. First, however, it is necessary to evaluate Mills’s evidence. What shall be considered here is the possibility that the Great Mosque of Cordoba is the result of a process of renovation and extending of an existing pre-Islamic building, rather than a freshly created structure. 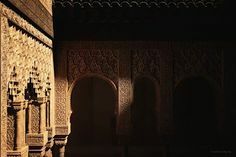 What also needs to be appreciated is that the quintessence of the Spanish Islamic style, whose architectural vocabulary spread within Spain and North Africa, may owe its appearance and substance to an earlier culture. With regard to the question of the qiblah and the mosque’s orientation, Mecca from Cordoba is 10 degrees and 14 minutes South of Eastxv, yet the mosque actually faces 60 degrees South of East. Mills’s evidence may be accepted, derived from Hawkins and David King (1982), that the Ka’ba also aligns 60 degrees South of East, so that the Great Mosque of Cordoba and the Ka’ba are axially parallel. Mills attempted to learn more of the mosque’s construction history by using carbon-14 analysis. With the help of the Spanish Government, he collected wood samples from the mosque and submitted five of them for carbon-14 dating analysis. The results were detailed and quite astonishing, for some of the datings produced had a mid-point date of AD 681 plus or minus 60 years. One can only comment on their accuracy by examining the full results – a task which is however beyond the time allowed for this research. However, their implications are important, for, if they are correct, one may be looking at a building first constructed long before any Muslim had arrived in Spain. Working from the building’s interesting orientation, Mills puts forward a hypothetical reconstruction of its development through time as follows. During the Phoenicians’ presence in Andalusia, from the twelfth to the seventh centuries BC, they may have built a combined religious and commercial centre. The building may have functioned simultaneously as a temple, an audience hall, and a warehouse. In addition, its tower may have served as an astronomical observatory .Later, the building could have been used by the Carthaginians from the sixth to the second centuries BC. The Romans would have found it advantageous to retain the building and continue using it as a warehouse from the second century BC to the fifth century AD. Continuing with Mills’s hypothetical historic reconstruction, the Visigoths, from the fifth to early eighth centuries AD, may also have continued to use the building, perhaps even renovating it. This would correspond in time to Mills’s wood sample taken from a roof beam. The Visigoths’ presumed need for a watch-tower and a lighthouse may have encouraged them to rebuild a destroyed tower, but this time with a central masonry wall spire for reinforcement. The accepted account of this tower’s being the second minaret built by ‘Abd al-Rahman II may be somewhat adrift from reality, since his work may only have involved repairs and cosmetic work. The fact that this tower had replaced an earlier minaret built by Hisham I has, according to Mills, never been proved, although foundations for some structure still exist in the courtyard. In the Visigothic period, the North-West area of the building, the reputed Stage I of the mosque, may have served as a functioning Church of St. Vincent. Mills’s sample no. 4, which was taken from a wood ceiling panel and dates from AD 785, may have been the replacement for an existing panel. Taking this further, according to Mills, interpreting Stage I of the mosque as a reworking rather than as a new construction, allows for the otherwise improbable assertion by al-Razi that Stage I of the mosque was built in one year. If the foundations and exterior walls were already in place, the repairs and replacements of the interior columns and arches would account for the presence today of reused Byzantine, Visigothic, and Roman capitals in the prayer hall. Stages II and III, from AD 822 to 961 respectively, probably completed the reworking of the remainder of the hypostyle hall as far South as the present mihrab, which, in Mills’s opinion, may originally have been a Phoenician altar. If this is correct, i.e. that phases I, II, and III of the Great Mosque of Cordoba were in fact merely internal work built into an already existing structure, there will no longer be a conflict between the extent of the third ‘external’ enlargement deduced by the geometric analysisxvi and the more accepted level of work carried out by al-Hakam II (961~876), especially if no external walls or roofs were constructed. However, the conclusions are still valid as far as the sequence of the internal enlargements are concerned and these, as have been seen, reflect a pure geometric system of three interlocking circles with evidence of 1:2 and 1:V2 proportions. Whether or not Mills’s theory proves correct, this does not affect the credibility of the results for the simple reason that, whoever constructed this building, its dimensions adhere to a strict geometric framework, one which must have been charted by the Muslim occupiers even if their work was contained within an existing structure™11. However, Mills’s conclusion appears to go a long way in overturning Creswell’s findings, for if the Great Mosque of Cordoba™ has always been one building, one needs to re-examine Creswell’s report ‘and further confirmation is supplied by the fact that the masonry of the Western wall breaks bond immediately to the South of the point where this arcade strikes it, (Allan, 1989, p297). Mills accepts that Stage IV of the mosque’s expansion was a Muslim expansion (apart from the Eastern wall) to the previous phases I, II, and III, and adds, ‘This Stage IV construction seems to be generally inferior in that the voussoirs of the interior arches are of stone with painted stucco rather than alternating red brick and limestone.’ At the end of his article, Mills leaves the following questions that he believes still require answering. How did the style of double-tiered, lobated interlaced arches and intertwined cupola arches come about with such skill and without apparent precedent? Why are there no visible construction joints at critical parts of the perimeter wall of the building where evidence of discontinuities of construction should accompany phased building activity? Why are there underground chambers beneath the floor of the mosque? Did these chambers extend over part or all of the footprint? If they did, were they storage cellars for the original non-Muslim building? Besides the fortress-like character of the construction, suitable for a secular construction, why would the Umayyads have built Stage II towards the South, between 961 and 976, thereby creating an elongated oblong form atypical of mosque configuration? The mosque in the palace-city of Madinat al-Ziihirah, built shortly after the Great Mosque of Cordoba in 936, some five miles to the North-West of Cordoba, is closely oriented toward Mecca. Why should this be so since, if reason had been strong enough, it could have been constructed parallel to Mecca like the Great Mosque of Cordoba?. Why do the roofs of the Great Mosque of Cordoba appear not to correlate with alleged stages of construction as one would expect? Having examined Mills’s proposal and pondered over his questions, it may be concluded that the building evidently had a complex history involving extensive destruction and rebuilding over centuries. It therefore requires closer attention and a more efficient programme of excavations if archaeologists can make use of this geometrical analysis of the mosque and the probing questions of Mills, in order to present a picture closer to the true history of this magnificent building. concepts. As has been seen in the geometric analysis of the Great Mosque of Damascus, I was able with confidence to challenge the more accepted view of the building. See Jairazbhoy, Outline of Islamic Architecture, p87. I have decided to use Gomez Moreno’s plan for my analysis as it appears to be the most accurate representation to date. The dotted line in that plan refers to foundation walls discovered during excavations in the courtyard in the 1930’s. Unfortunately, this information has not been incorporated into later published plans of the mosque. iii However, no scholar explains why ‘Abd al-Rahman II extended the mosque only by 8 bays. vi To me this suggests the same method, discussed in an earlier chapter, of setting out the building on site using rope stretching and chalk marking. vii All scholars say that Abd al-Rahman II extended the mosque by 8 bays. See e.g. M. al-Tilimsani, Naf; al-Tib fi Ghusn al-Andalus alRatib (Cairo, 1949); R. Arie, L’EspagneMusulmane aux Temps desNasrides (1232-1492) (Paris, 1973); R. Castejon, LaMezquita Al Jama de Cordoba (Leon, 1973). ix Stage C was to the North only. xi When Abd al-Rahman III built Madinat al-Zahra, his chief architect and geometer was Maslama ibn Abd Allah. See ibid., p78. xv Mills confirmed this orientation in October 1990. Readings were taken on the roof-tops of the mosque. He aligned the pinnacles of the two mosque cupolas on an axis with the mihrab. xv1 , See drawing no. COR/A4. hall. See chapter 6 section 6.
xv111 By ‘mosque’ here we refer to phases I, II and III. Jairazbhoy, RA. (1972) An Outline of Islamic Architecture. Bombay Lambert, E. Histoire de la Grande Mosquee.